First, we added styrofoam domes (from any craft supply store, but in our case, Michaels) to the top of the cactus and the ends of the arms, in order to get the nice rounded shape. Then we used duct tape to wrap the cactus in batting. Since the bottom half was a little thicker than the top, we double wrapped the top to ensure a more even shape throughout. Kelly hanging out with our short-lived friend, Huggy! You can see the batting taped around the arms and bottom here. Then… a lot of sewing. 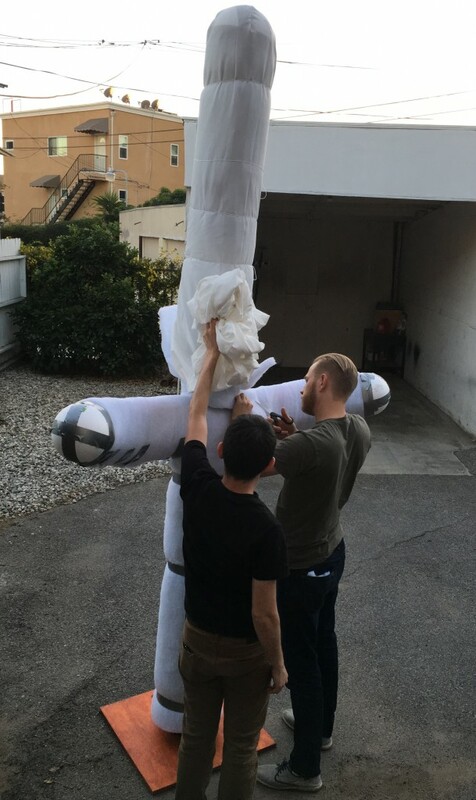 We knew it was coming, and we thought we were prepared, but we hand-stitched a 10′ cactus with a 7′ wingspan – twice. First, the interior layer. 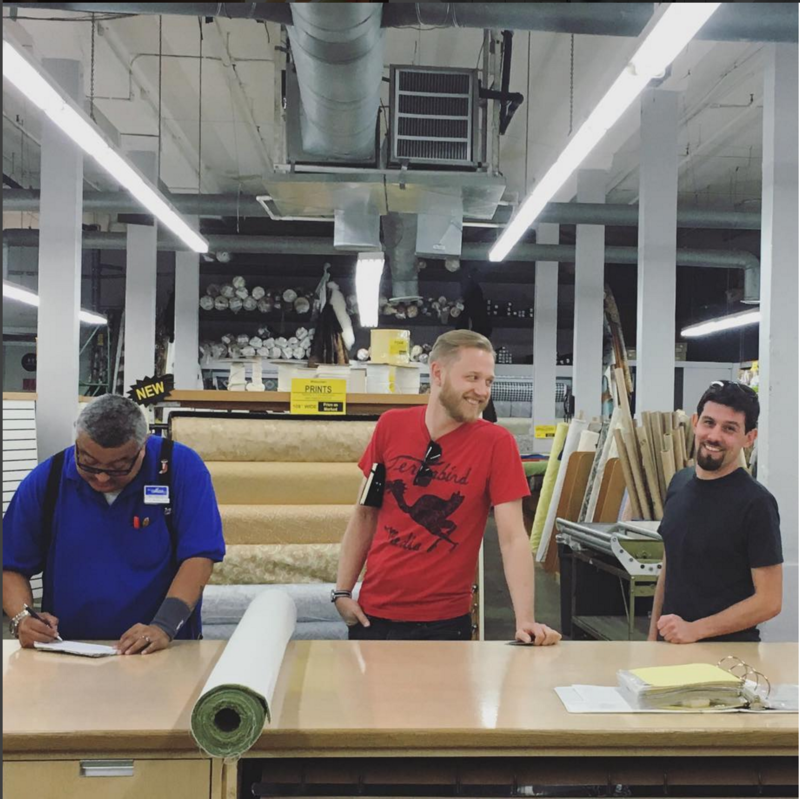 Like I mentioned in the previous post, we picked up a cotton/poly blend fabric for the interior in an effort to keep the cactus’ shape throughout (what is hopefully) many rounds of assembly and disassembly. You don’t build one of these for a one-time use. Okay, so first things first, today was one of those days where Kelly absolutely floored me with her generosity and love, but in a totally different way than a standard Valentines’ day gift. Instead of going out to a dinner, a movie, giving each other cards – she introduced me to the fashion district downtown and helped find the needed fabric to make this cactus come together. Not everyone would be generous enough to spend Valentines’ Day working on a project this big, tedious, and messy but she did and it truly meant the world to me. 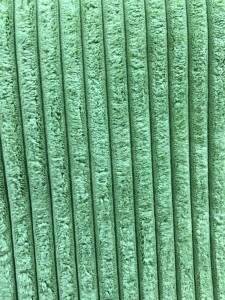 This upholstery fabric would probably look terrible anywhere else, but for a huggable cactus? PERFECT. So: Fashion District!! I had never been down to the fashion district in LA before but it’s a lot of fun. There’s an unbelievable number of shops selling countless fabrics by the yard. We ended up having the most success at Michael Levine. We picked up batting (the stuff you’d put inside a pillow or teddy bear), a stretchable cotton/poly blend for the interior fabric, and the most magical find of all: an upholstery fabric that could not be more perfect. 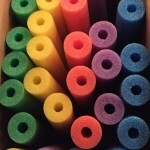 A giant box of pool noodles! Once we had the pool noodles on hand, we used a lot of duct tape and made sure to tape individual noodles directly to the pvc pipe, so we can twist the entire piece as a single unit. Since the piece is going to have to disassemble to be transportable, we’re using male/female screw-ends on each of our major sections so the cactus can be broken down easily. We ended up working with a straight top, (the bent top you see below was an experiment we decided against). Also, at the stage you see here, the cactus is 12 feet tall. Eventually, the cactus was trimmed down to 10 ft to accommodate the fabric. So, the Long Beach Comic Expo is coming up and Spencer and I will be there February 20th and 21st. We’re really looking forward to the experience and hoping against hope that the books have arrived in time for the expo. If not, we’ll sell prints and get creative with getting the word out about the book. Well, really, we’re going to get creative either way. We’ve decided that in order to get some attention while we’re there, and have something else awesome to talk about, we’re building a cactus. 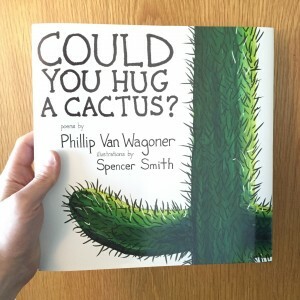 A 10’5″ huggable cactus. Now, neither Spencer and I are professional builders, but we do like making cool things and we’re relatively handy. At least, enough so that we’re willing to undertake the project. The materials you see used here to build our skeleton are pretty basic. I’ve got some 2″ schedule PVC pipe – both a 10′ straight pipe and a large curved for the arms. I’ve got a 2″ 4-way connector, a 2″ to 4″ adapter that I’m using to connect to a 4″ debris cap that happens to be very sturdy and have 8 slots to accommodate 1/4″ bolts. The bolts are connected to the bottom of our 2′ x 2′ plywood base with standard 1/4″ nuts. The bolts will be cut to ensure that the base sits flat on the ground. So, getting this guy in the mail was incredible. 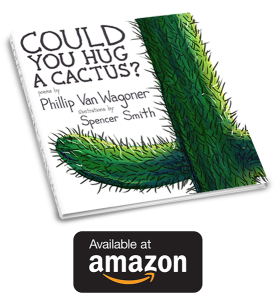 Spencer and I have worked so hard to make Could You Hug A Cactus? a reality, and finally getting to hold it is pretty special. The fabric-wrapped cover is amazing, the art looks amazing on the page, and we are really, really proud. Really though, as I sit with this nervousness a little, the reality of what kind of efforts this undertaking will require, I’m more excited. All of the nerve-wracking, laborious, and menial work that will go into making my new endeavor a reality are precisely what make it real. And that is what is exciting. I’m anxious about my new path. I’m excited to put in the real effort, and I have a feeling in the pit of my gut that this is what I should be doing. Thank you again to everyone who believed that this was possible, to all the wonderful folks who helped make it happen, and to all of the people I’ll meet in the near future that will help make it real. Hey! So, now in the process of finalizing all of the files for our book and I come to this wonderful little hurdle. The AUTHOR BIO. This feels so strange. Now, I’m getting ready to take professional photos tomorrow morning in an effort to convince somebody that I’m a responsible adult, and trying to write all about myself in a pleasant, interesting and marginally mature manner. So, it’s not surprising that I can’t take it seriously. Check out my first draft! Thank you all so much for being a part of this journey with us! 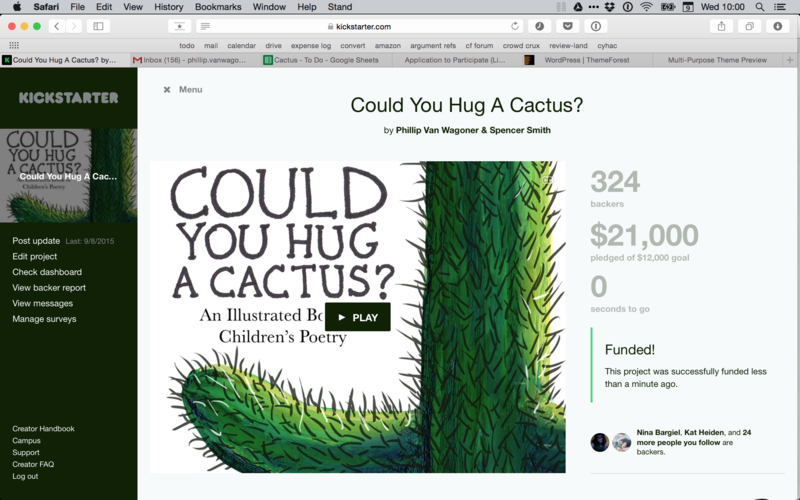 Thanks to your amazing support, in only 30 days, we raised $21,000 from 324 backers to help us turn “Could You Hug a Cactus?” into a real book. We’re going to be working very hard over the next few months to get the book and other rewards made and into your hands as fast as possible. We will keep you in the loop on our progress and make sure you know where we are every step of the way. If you have any questions, please don’t hesitate to get in touch. Hey everyone! Thank you so much for your support! Being able to know that we are making this book is incredible and we couldn’t have done it without you! For those who haven’t already checked it out, preorders are still going on until September 9th on the Kickstarter page, so you can still get it on the action and get a bunch of cool extras for being a part of the launch!